Applied ethnomusicology has for decades sought to develop ways of extending the influence of music studies also beyond academic contexts: for example, in relation to the sustainability of various music cultures and through music’s potential roles in tackling social and political problems. However, currently widespread discussions about the ”impact” of research and the significance of cross-disciplinarity urge music scholars in any area of study to critically reflect on the scholarly and potentially broader social implications of their work. Through what different strategies might music researchers respond to, or confront, the expectations concerning the ”impact” of research that are currently prevalent in political and public discussions about the significance of scientific knowledge? What kinds of roles and responsibilities might music studies have in relation to timely cultural, social, environmental and political phenomena and challenges? Can music scholarship be multi-, inter- or cross-disciplinary? Should it be? Is ”applicability” the most apt term for describing the movement of ideas, approaches and influences between scientific fields or academic research and the wider reality? Could we develop alternative or more apposite and fruitful ways of making sense of, assessing, enacting and contesting these movements? Please send your abstract (max. 200 words per proposed paper) by email to the following address: mtsymposium2018(at)helsinki.fi. Proposals should be sent as attached files (in pdf or word format). If you are proposing a themed panel consisting of several papers, please also send these as one document. Please remember to include your email address(es) in the attached file. We will send out notifications about the results of the selection process by the end of January. 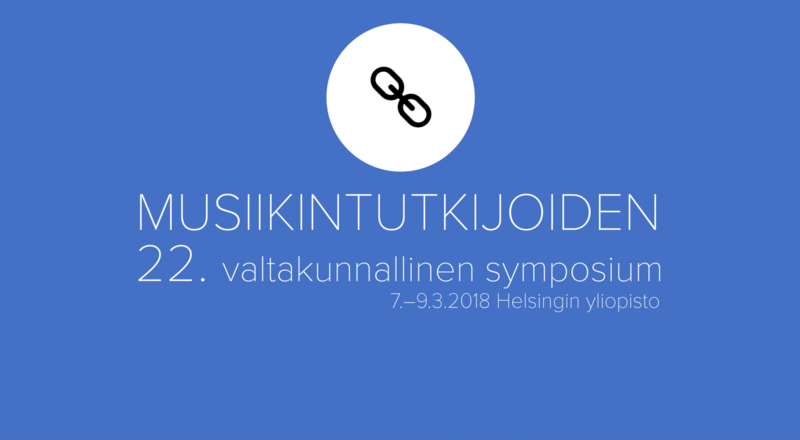 The symposium is organized by the discipline of Musicology at the University of Helsinki in collaboration with the Finnish Society for Ethnomusicology. It has been supported financially by the Federation of Finnish Learned Societies. The event is organized with support from the Finnish Musicological Society, the Music Archive in Finland, and the Music Society of the University of Helsinki. The detailed program will be posted in January 2017. 7.3.2018: Symposium starts at 12:00. Presentations until 5:30 pm, opening ceremony from 6 pm. 8.3.2018: Presentations from 10 am to 5 pm. Symposium dinner from 7 pm (registration required). 9.3.2018: Presentations from 10 am to 5 pm. Symposium ends. Registration to the symposium will begin in late January 2018. Symposium dinner will be organized on March 8 in restaurant Piano (separate booking will bee opened with the registration form). The symposium is organized at the main building of the University of Helsinki (Fabianinkatu 33) in the central campus, right next to the Helsinki Cathedral. Several hotels from different price ranges are situated nearby the hotel, but public transportation offers good communication to the campus also from further away. Please see the Helsinki area public transportation route search for details. More options can be easily found on hotel fare aggregator websites.